Today I am going to share with you one of Countryboy’s and I’s absolutely favorite recipes that comes out of the Home Sweet Dreaming kitchen. Tonight (September 6) I will be cooking this for my Ever Wandering ‘Countryboy’ as he is off on another mountain hike. 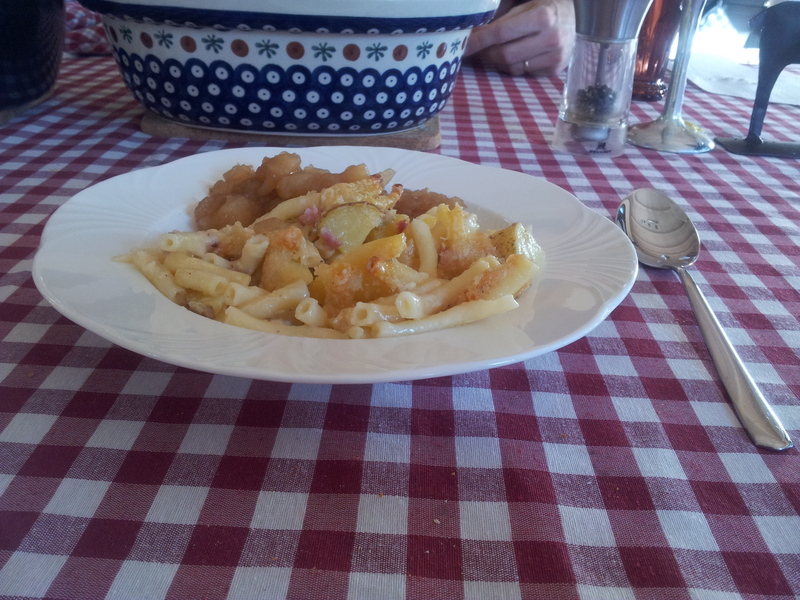 Älpermagronen is basically macaroni and cheese, Swiss style, together with potatoes. 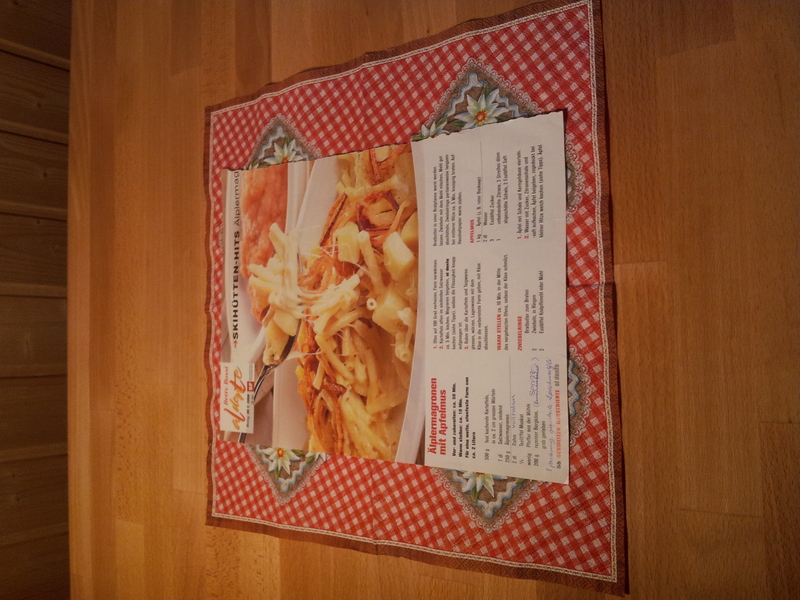 I first fell in love with this traditional Swiss dish, on one of my first trips to Switzerland. Countryboy and I were visiting Luzern and stopped at one of the popular restaurants along the river there, not far from that bridge that is Luzern’s beautiful icon. 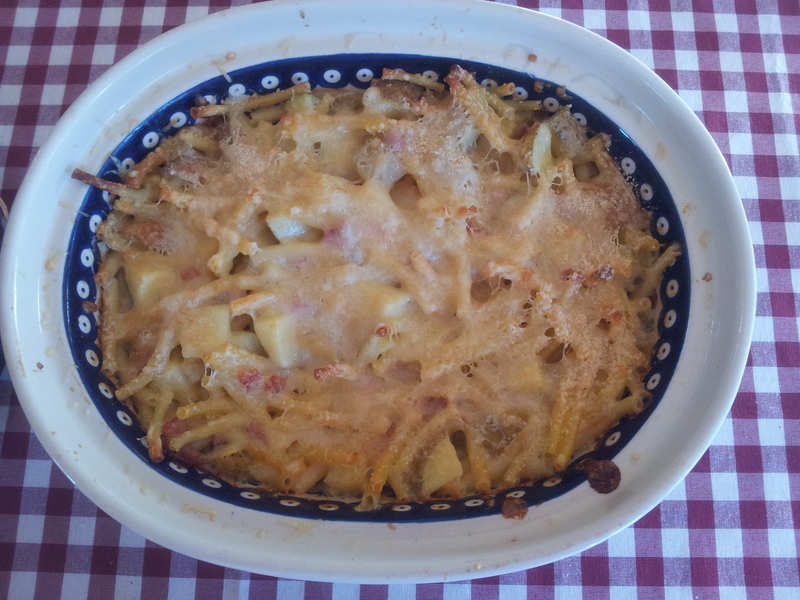 The original recipe I used, was from some magazine in which this Betti Bossi recipe was published. Since I first made this dish, there have been many experiments and dramas!!! Heaven forbid I try to change my original version of this recipe one bit!!! In any case this is Countryboy’s favorite and a frequent visitor to our table. He will even drop everything at work to come home to eat it, and that is saying something. In any case, it is wholesome, satisfying; and served up with the traditional Swiss side of applesauce, or/ and a green salad, can be called a well balanced meal. 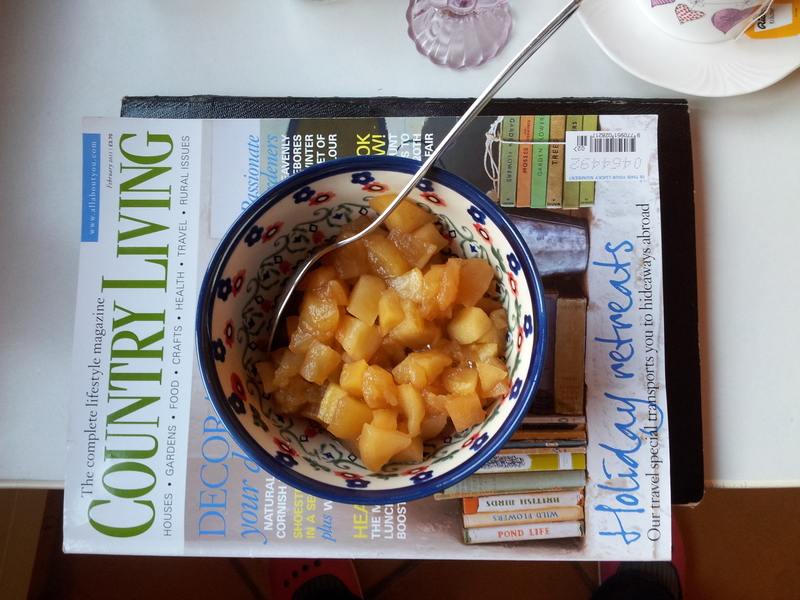 At this time of year when the apples are ripening quickly in the local orchards, the days are getting colder and shorter, it certainly brings a lot of comfort to hungry stomachs on a long day. I have still got a lot of experimenting I want to do, trying out a few more versions in these books but for now I think this one is good enough to give you a taste of Swiss cuisine. I sincerely hope you try it out, should you have any Älpermagronen, family recipes or any other family recipe that brings joy to your table, please share it with me!! It is so important that we cherish those old family recipes and make new ones! P.S. I started this post on Saturday, September 6th, and am finishing it now. 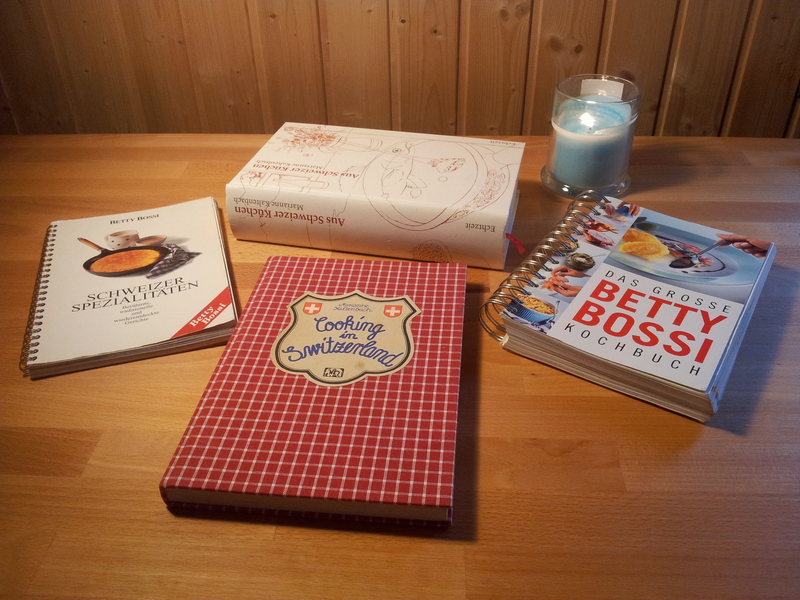 Recipe writing takes a lot of time, especially with two versions If you would like to read Countryboy’s report about his hike in Appenzell and Toggenburg you can go to his hiking log here . Cooking Time: ca. 25 min. 500 grams potatoes chopped roughly to about 2 cms . 250 grams Älpermagronen ( long straws of pasta ca. 2 inch long). 200 grams Emmentaler/ Gruyère grated cheese mix (Emmentaler is what Anglophones know as Swiss cheese, the original recipe uses only this but I prefer a mix of these two cheeses as it gives it more flavor. Emmentaler is very mild and Gruyère has more of a kick. 1. Preheat the oven to 180 Celsius (Convection Oven), preheat baking dish if glass or pottery, grease dish with butter. 2. In a medium sized saucepan cook potatoes,uncovered in boiling, salted water for ca. 5 minutes. Add Magronen, cook al dente , so that the fluid is mostly evaporated (ca. 7-9 minutes). 3. Rahm über die vorbereitete Form geben, mit Käse und gekochte Speckwürfli anfertigen. Pfeffer und Muskatnuss darüber streuen, alles zusammen mischen. Mischung sollte ein bischen flüssig noch sein um dem Auflauf feucht zu behalten im Ofen. 4. ca. 25 Minuten in der Mitte des vorgeheizten Ofens backen, bis der Käse gut geschmolzen hat und eine schöne goldene Krust kriegt. Esse dazu ein schönen grüne Salat, Zwiebelringe und Apfelmus für das beste Schweizerische Erlebnis! Vor und zubereiten: ca. 50 min. Für eine weite, ofenfeste Form von ca. 2 Litern. 1. Ofen auf 180 Grad vorheizen (im Umluft Ofen), Form vorwärmen, eventuell Butter drauf schmieren. 2. Kartoffeln offen im siedenden Salzwasser ca. 5 Minuten kochen. Magronen beigeben, al dente kochen, so dass die Flüssigkeit knapp aufgezogen ist.